You will LOVE this TOP FLOOR, CORNER UNIT PENTHOUSE at the GROVE! 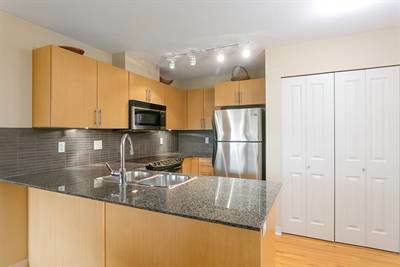 This Northeast Facing, OPEN CONCEPT, 891 sqft 2 Bed, 2 Bath condo is GORGEOUS & MOVE-IN READY. Great features include: Stainless Appliances, Granite Counters, Laminate & Tile Floors, fireplace, and a Master Suite with Walk-in Closet & Soaker Tub in the en-suite. SURROUNDED by windows for lots of natural light, overlooking the QUIET side of the building! Your spacious 150 sqft balcony is perfect for BBQ's and entertaining. BONUS: 2 Secure Underground Parking spots and 2 Storage Lockers! This GATED complex has an onsite caretaker and HUGE contingency fund. WALK to EVERYTHING: Express Transit to Skytrain, Groceries, Restaurants, Starbucks & more! Pets & Rentals allowed!